Broward County South Florida Truck Accident Lawyer | Law Office of Andrew G. Rosenberg, P.A. In just one instant, a large truck crash can change your life. Whatever you were doing is sidelined by the significant injuries that you’ve suffered, and by the overwhelming task of receiving a fair settlement for an accident that someone else caused. Semi-trucks, 18-wheel flatbeds, tanker trucks, commercial buses—all have the potential of causing catastrophic injuries to people in passenger vehicles simply because of the difference is size, weight, and force of impact. A semi truck pulling a trailer loaded with cargo can have a total weight of 80,000 lbs. That's 40 tons traveling at approximately 55 mph, maximizing the force of impact to astounding levels. Truck drivers. Truckers who are distracted, fatigued, drunk, or otherwise negligent behind the wheel may be responsible for accidents and victims' resulting injuries. Trucking companies. Fleet employers with negligent hiring practices, that have policies or procedures that encourage unsafe driving, or who knowingly fail to provide safe vehicles may be held liable. Truck manufacturers. A manufacturer that produces a vehicle that's inherently unsafe because of the way it was designed, built, or because of faulty parts can be liable for resulting crashes and injuries. Truck mechanics. Federal regulations governing large trucks require many standards of maintenance. Anyone negligent in repairing or maintaining a semi or bus may be held responsible. Operator fatigue. 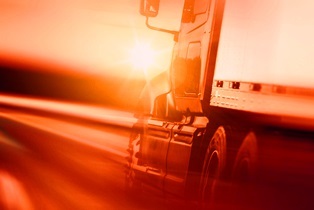 Truckers are under a lot of pressure to get to their destinations. Despite strict federal government hours of service rules, some truckers are driving when they're drowsy, which slows reaction times and reduces evasive maneuver responses. Distraction. When a truck driver's attention is diverted by texting, using their phones, finding entertainment, daydreaming, eating, drinking, or any other activities, he has less time to recover if there are hazardous road, weather, or traffic conditions. Drug or alcohol use. Just like with any motorist, a truck operator must comply with local, state, and federal regulations regarding driving while under the influence of drugs or alcohol. Comprehension, reaction times, and alertness are all compromised. Poor health. Many different health conditions can impact a trucker’s ability to drive safely. Sleep apnea, for example, is a major concern because of its threat to fatigue. Employers are required to screen drivers for these conditions. Speeding. A loaded tractor-trailer on the interstate traveling at 55 mph needs the length of at least two football fields to stop safely. While some large trucks have speedometer regulators, others may not have such restrictions, and a driver on a deadline—especially one imposed by a fleet company—may do whatever is necessary to deliver the cargo on time. Improper cargo loading or securing. Cargo that shifts or falls off a truck can cause a trucker or another driver to lose control of the vehicle. Blind spots. You've seen the signs posted on the back of trailers: "If You Can Read This, I Can't See You." It's up to the trucker to account for these blind spots and only change lanes or proceed when it's safe to do so. Maintenance issues. Trucks with improperly-inflated tires, bad brakes, or other mechanical problems make it difficult for operators to avoid crashes. A full investigation into your accident will need to be done in order to determine the cause of the crash, why you were hurt, and who's responsible. Information from the accident scene. Pictures, video surveillance, the police report, and contact information for any accident witnesses may be useful to your case. Documentation from the trucking company. Employment records, maintenance records, driver's logs, and other details regarding the operator and large truck can establish potential liability on the part of the operator or third parties. While not all of this information is available in every case, it's important to gather as much of it as possible to prove what happened. An experienced truck accident lawyer knows what to look for and how to compel the trucking company to share the necessary information. Healthcare costs. This accounts for all medical expenses such as hospitalizations, surgeries, medications, doctors’ visits, and rehabilitation therapies. Lost income. Any wages, benefits, or income from self-employment that you're unable to earn due to your injuries should be part of your recovery. Out-of-pocket costs. Any property damage or other out-of-pocket expenses should be a part of your case. Pain and suffering. In addition to severe physical pain, you may suffer emotional distress as you come to terms with how this accident altered your life. Additional compensation may be available if a loved one died or as a result of injuries sustained in the accident. A wrongful death case provides justice for negligent actions. Attorney Andrew G. Rosenberg is committed to helping you get the full and just recovery you deserve. He'll treat you like you a member of his family and aggressively fight for your rights against the trucking company and its insurance company—both in and out of court. Call today to schedule a free, no-obligation consultation.